Camp Stanislaus, by the bay. Camp Stanislaus – Beat the heat! I’ve written several pieces for GoNOLA.com on how New Orleanians beat the summer heat. Leaving New Orleans doesn’t fit with the tourism-promotion. Let’s escape to the Mississippi Gulf Coast here. Most houses in the city didn’t have central air conditioning in the 1930s-1950s. So, folks in the city relied on nature to cool off. You can see it in the architecture of old houses. High ceilings, transoms to allow for good natural air circulation, big porches. Yards had lots of trees and other shade plants. In spite of all these things, there are days where you just couldn’t beat the NOLA heat. The men didn’t have many options on this; they had to go to work. The wives, however, were at home with the kids, often trapped without a car. With no 24/7 cable television, kids were left to their own devices for entertainment, and got bored easily. After a week or two of this, mom would be totally done. Stick-a-fork-in-her done. It was time to go to Waveland. Or Bay St. Louis. Or Long Beach. Families would team up to buy some property in one of the towns along Highway 90 in Mississippi. They’d build small camp-style houses there. The women would pack up the kids and head out of town. The men would head out N. Claiborne Avenue, to Chef Menteur Hwy, across the Rigolets Pass, and out to the coast on Friday afternoons, driving back to the house in the city on Sunday night. Campers and couneslors at Camp Stanislaus, 1950. In an on-line political discussion a couple weeks back, one person mentioned that they were surprised that one of Louisiana’s most powerful politicians of the 20th Century, T. Hale Boggs, was born in Mississippi. I pointed out, yes, he was born in that state, but he was born in Long Beach. Clearly the Boggs family did the escape routine in the summer, and momma gave birth to baby Hale while away from the city. That didn’t make him any less a New Orleanian, that’s for sure. Not everyone could get away to the coast for an extended period of time, though, and the kids still drove those parents crazy. When you just couldn’t pack up and get out, one of the other options was to pack up the kids and send them off. One possibility for that was to send the boys over toCamp Stanislaus, at St. Stanislaus College in Bay St. Louis. The college-prep high school, run by the Brothers of the Sacred Heart, has been around since 1847, as a boarding school for young men from New Orleans. In the summer, the students go back home, so the Brothers monetize the campus with Camp Stanislaus. The Brothers of the Sacred Heart founded St. Stanislaus College in 1854. The concept of a boarding school for boys appealed to families in New Orleans and Mobile. The school grew rapidly, and was well-established by the Civil War. The Institute closed the school to boarders at start of the war. They sent several brothers to New Orleans. They taught their students from the city in Annunciation Parish in Faubourg Marigny. After the war, the Archbishop of New Orleans invited the Institute to set up a permanent school in the French Quarter. He gave the brother a house on Chartres and Barracks Streets. This was the first location of St. Aloysius College. Even though the BOSH taught in New Orleans through the war, we date the involvement of the Institute in the city from 1869, and St. Aloysius. 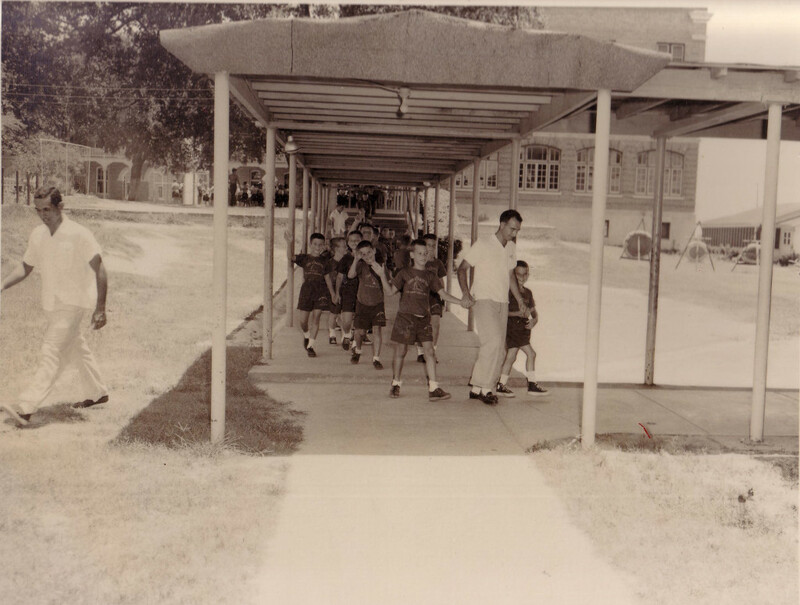 The lead photo (above) features kids at Camp Stanislaus in the 1950s. Campers are moving from one place to another on the SSC campus. Below, a shot of the Camp Stanislaus staff from 1939. Some of the BOSH loved working summer camp, but for others, the camp was a sticking point. The BOSH are a teaching order, and summer sessions were the only time many of the Brothers could continue their personal education paths. It’s hard to finish that master’s degree when you’re running around after a group of kids. 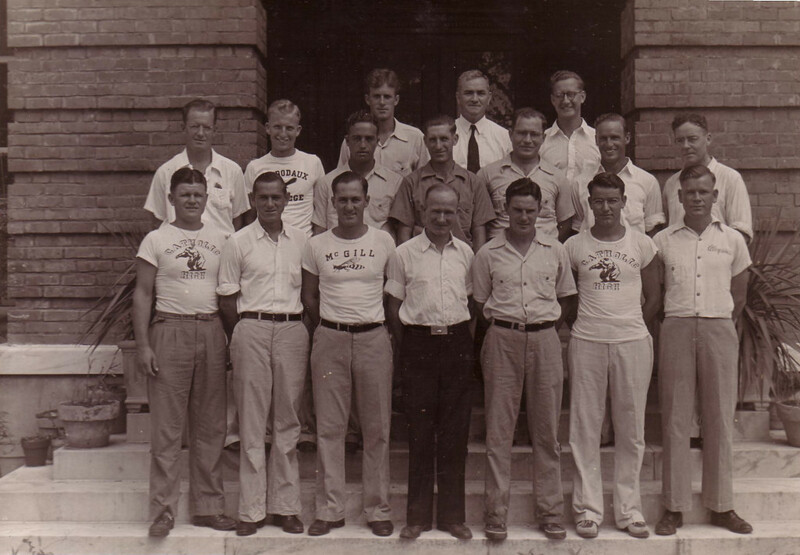 Camp Stanislaus counselors, 1939. All of these men are Brothers of the Sacred Heart. Camp Stanislaus continues on to this day. It’s a great experience for young boys, to get out of the city for a week or two, exposing them to the MS Gulf Coast, and putting them in touch with an earlier time. Improving swimming skills and learning to sail are just two examples. It’s not just about the water. Getting out under the trees for a while is a wonderful thing. It’s scenes like this that separate city schools from boarding schools. Of course, if a family doesn’t want to pack up and send off the kid, the BOSH community at Brother Martin High School has day camp sessions, too. For more on the Institute and its schools in the city, check out my book, Brothers of the Sacred Heart in New Orleans.